Libyan opposition literally running protests from Washington. When Qaddafi's son, Saif al-Islam, accused foreigners and opposition groups of fomenting unrest within Libya, it appears no truer words have been spoken. It is not surprising BBC and the rest of the corporate owned media went through extensive measures to discredit his speech. Unbelievable revelations have been discovered regarding the unrest in Libya. The leader of Libya's opposition group organizing the protests both inside and outside of Libya, is currently in Washington D.C. as he and his organization direct the upheaval and bedlam consuming the North African nation. An interview with Ibrahim Sahad of the National Front for the Salvation of Libya (NFSL) on ABC Australia, features every talking point covered by the mainstream corporate media from over the past week, all with the White House and Washington Monument looming over him in the background. the UNSC to convene and discuss intervening in Qaddafi's defiance. Ibrahim Sahad and his NFLS formed the National Conference of the Libyan Opposition (NCLO) in London in 2005. This group specifically went out of its way to appear not to be influenced or supported by the United States. Perhaps to cement this notion, Huffington Post featured documents released by the NCLO in a wikileaks-esque move to pin US support on Qaddafi. Of course, as with all the unrest in the Middle East, as the facts trickle out we find out this is not to avoid confusion, it is to avoid the truth. The Sahad's NCLO began organizing the February 17th "Day of Rage" right on cue as Egypt fell so the mainstream media apparatus could swing around and put the focus on Libya. Conveniently, the media needs only move from Cairo to Egypt's western border and wait for Sahad's men on the ground to secure them a base of operations, presumably in Libya's eastern city of Benghazi. 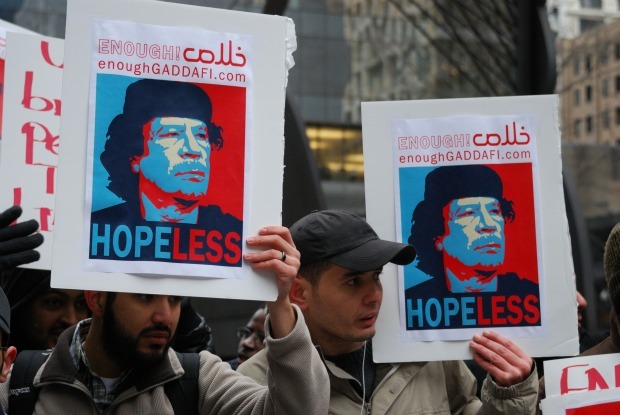 Qaddafi apparently understands the role of NGOs and the foreign media, which is why they are not in the streets of Libya's cities, and coverage has been admittedly daunting. It turns out that both the corporate owned news and the US State Department/corporate funded Movements.org are getting their reports entirely from Sahad's NCLO in Washington, who claims to be in contact with "first hand" reports out of Libya. Other NFSL members including one in Dubai, are also supplying the media with this "first hand" information. These reports have become the basis for accusations of "genocide", the convening of the UNSC, economic sanctions, threats directed toward Libyan security forces that attempt to quell protesters, and NATO enforced no-fly zones. The Neo-Con infested National Endowment for Democracy and its army of US funded NGOs recently made an official statement urging the US and EU to confront the Libyan "massacres" in the UNSC and Human Rights Council. This is still amidst reports BBC admits are "impossible to verify," based on information coming from Movements.org and a Washington based Libyan protester leader. It should also be noted that a Ghonim-esque Libyan blogger is being reported by US corporate funded Movements.org as a "Twitter user to follow." He goes by the name "EnoughGaddafi" and is the webmaster of LibyaFeb17.com. EnoughGaddafi's work can also be found archived on Washington based Ibrahim Sahad's NFSL site (EnoughGaddafi.com was hacked according to Movements.org). Again we are told the protests are spontaneous, inspired by the Tunisian and Egyptian uprisings. Again we are told it is the youth yearning for freedom and "democracy." But when we look behind the curtain, we see yet another old man from Washington pulling the levers, blowing the smoke, and flashing the lights. If you are religious, pray for the people in the streets of Libya, many of whom may be merely swept up in this cruel hoax. The US and their stooges will only be disheartened if their plot doesn't succeed. The rivers of blood that will flow to ensure that it does is never entered into their calculations. When your US State Department sponsored "liberation" comes to you, you will hope others elsewhere will stand in solidarity with the truth, not the emotions of an engineered hoax. You will hope others take it upon themselves to speak the truth amongst the deafening din of corporate media propaganda. So spread the word, wake your neighbors up, and most importantly, boycott the corporations whose greed drives this agenda and whose members are planning and carrying it out. Do it for the Libyans, the Egyptians, the Tunisians, and do it for yourself. The conflagration is consuming the Middle East and North Africa now, it may consume you next.